The Sasikala Natarajan camp, which too has approached the EC seeking control over the party, will present its case before the poll panel on October 13. New Delhi: The O Panneerselvam and the E Palaniswami camps, which merged recently, today staked claim over the AIADMK and its 'two leaves' election symbol before the Election Commission (EC), claiming support of a majority of lawmakers and party cadre. The EPS-OPS camp told the Election Commission at a hearing, which lasted two hours, that Ms Sasikala and her nephew Mr TTV Dhinakaran, who was appointed deputy general secretary of the AIADMK by her, have been removed from the party and cannot stake claim over it or the 'two leaves' election symbol. The EPS-OPS camp's counsel and former attorney general Mukul Rohatgi told the Commission that Mr Dhinakaran was not even a member of the party the day Chief Minister J Jayalalithaa passed away on December 5 last year. In an interim order in March this year, the Commission had barred the then rivals-Mr Palaniswami and Mr Panneerselvam-- from using the party's name or its election symbol in the RK Nagar assembly by poll necessitated due to demise of Jayalalithaa. The by poll, for which the AIADMK had fielded Mr Dhinakaran, was later cancelled due to alleged bribing of voters and is yet to take place. "All the members of the AIADMK have buried the hatchet and now only Dhinakaran, who claims to have only 18 disqualified MLAs, is on the other side," Mr Rohatgi told reporters after the hearing. 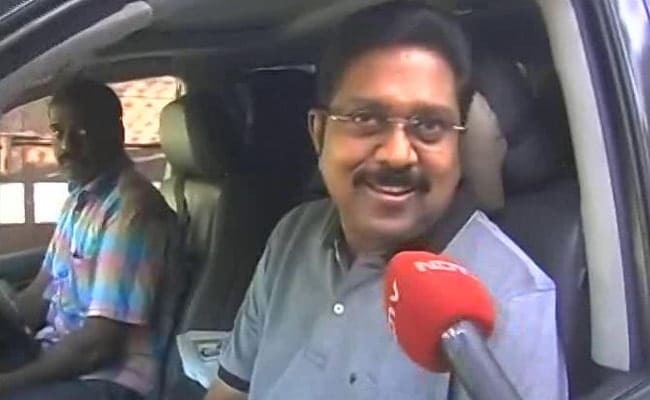 Mr Dhinakaran had moved the EC, the Madras high court, and today the Supreme Court seeking more time to file fresh affidavits. But his pleas were rejected by all of them. The Supreme Court today directed the Election Commission to decide by November 10 the claim of rival factions over the AIADMK's election symbol and allowed it to proceed with the scheduled hearing in the case. One of Mr Dhinakaran's counsels N Raja Senthoor Pandian told reporters that the Sasikala camp demanded cross-examination of those who had filed fresh affidavits in support of the EPS-OPS camp. He said the EC accepted to hear the arguments of the Sasikala camp on October 13. He said the cross-examination would be the main issue the Commission would hear next Friday. The counsel for Ms Sasikala countered the arguments of the rival camp on her elevation and that of Mr Dhinakaran in the party after Jayalalithaa's death, reminding the Commission of its March 22 order which said that the issue of election symbol alone would be decided and that it would not go into any other issue. Prior to the merger, the two faction led by Mr Panneerselvam and Ms VK Sasikala had staked claim over the symbol. Tamil Nadu Chief Minister Palaniswami was then a Sasikala loyalist. The poll panel had, however, frozen the symbol, pending decision on their pleas. Later, a large number of legislators led by Mr Palaniswami revolted against Ms Sasikala, who is in jail in a disproportionate assets case, and announced merger of the two factions. Resolutions ousting Ms Sasikala as interim general secretary and Mr Dhinakaran as her deputy were also adopted at the party's general council meeting on September 12. On September 14, representatives of Mr Dhinakaran had approached the EC urging it to declare as invalid the general council meeting, citing a high court order that said any decision taken at the impugned meeting will be subject to the final outcome in the appeal.